The Rebel Sweetheart. : Spotlight | Laneige Water Sleeping Pack. Funny how I have several Laneige products in my makeup stash, but I haven't done a proper review of any of them. Sure, I've featured them in this haul post from last month, but that's about it. And so today, I am finally posting my first product review for the brand that Song Hye Kyo and Song Joong Ki endorses. And this being the first, I guess it's only proper that I write about the brand's most popular (and one of my most favorite) skincare product - the Water Sleeping Pack. Laneige Water Sleeping Pack_EX in a 20mL jar. I've been using the Water Sleeping Pack for quite sometime now, applying it twice a week in lieu of my regular night moisturizer (ergo, Human Heart Nature's Moisturizing Night Cream). And I must say, my skin looks better and has become healthier since I incorporated the Water Sleeping Pack to my skincare regimen. Just about everything is written in Hangul in this 20mL jar. 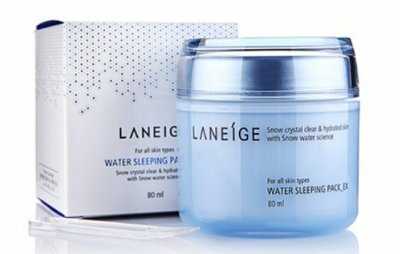 The Laneige Water Sleeping Pack is designed as a 'sleeping mask'. Meaning, the product should be applied before you sleep and left on through the night as the final step of your nighttime skincare routine. As you can see, the product is a light blue, water-based gel that's easily absorbed by the skin. It also has a soothing and cooling effect on the face when applied. Its patented 'Sleepscent formula' is very aromatic, which is not surprising since this formula includes essential oils from orange flower, rose, ylang ylang, and sandalwood. As for the ingredients of the Sleeping Pack itself, the core components include Beta-glucan (regenerates the skin), Ceremide SLN (prevents skin moisture loss), Hunza Apricot Extract (purifies the skin), and Chestnut Extract (improves skin texture). After applying the Water Sleeping Pack - dewy skin! Price in Korea = 25000 Won (approx $23 or Php970). - Gives a cooling sensation when applied. - Skin hydration at its finest. - Makes the skin soft and supple. - Didn't make my skin greasy or oily. But then again, this is a premium Korean skincare brand, and the product delivers. The older I get, the more moisturizer is becoming very important to me! Unfortunately, I still struggle with an oily T-zone so I really don't like moisturizers that are heavy or oily. This one sounds like it's exactly what I need! Seems like a nice product out on the market. I've never tried a nighttime mask but I do use Aveeno before bed and usually NeoCell or Lancombe in the AM. I got all those for free lol. They seem to be working! This product sounds really nice and light. I would not like sticky stuff on my face at night! i havent tried any night cream yet but this one seems nice especially endorsed by those famous idols. kkkk! but I really want to try the human nature products. thanks for reminding. hahaha! I love this product so much, even more than the firming variant. I think I have like 3 full sized jars in stock at home, lol! It's the first Laneige product I've tried ever and it was what got me hooked on the brand. I have heard so many good things about Laneige and its products but so far, I have yet to try any of their offerings. I don't know. Maybe I'm a bit intimidated by the price! hahaha :D Maybe soon! Looks like a nice skin product and maybe that's why it's a bit pricey. Interesting! I love products that deeply hydrates and nourishes at night especially that I stay in 24-hour air conditioned room. I would love to try this one out! I appreciate products that do not break me out. Thanx for sharing. The older I get, the more important taking care of my skin is. I wish I would have done more in my 20s. This sounds like an amazing product. Thank you for sharing. I just don't like when I can't understand the label. I always read labels so it's kind of a big thing for me, but if you're a reviewer I trust, then I would most likely go for it! I recently bought this during our holiday in Korea last month and have been using it too.. I too find it nice and good to use. I use it once-twice a week together with the other night masks that I have bought from face shop.